Whether you're looking for organic vegetables, local honey, artisan bread or a bouquet of sunflowers, lakeshore farmers markets are the best place to shop. Our seasonal list of area greenmarkets is designed to make the search for the latest crop of berries or sweet basil easy and fun. Along the lakeshore, summer is synonymous with beaches. And Lake Michigan boasts one of the most beautiful shorelines in the country. 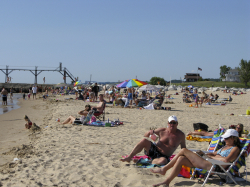 From New Buffalo to Muskegon, the lake effect is most strongly felt while walking along a sandy beach. So grab your sunscreen and flip flops and let's go to the beach. While strawberries have grown wild in Italy for over 2000 years, these succulent red fruits are also native to North America. Although strawberries symbolize romantic love and perfection, most of us only care that they are invariably delicious. Don't forget to check out the Calendar of Events for June and July. For boaters and campers we've compiled directories of boat rentals and campgrounds. 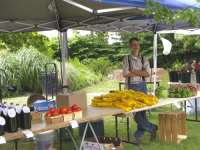 Foodie and locavore alert: LEL has compiled a list of Farmers Markets along the lakeshore. History buffs haven't been forgotten. This issue our Lighting the Lake section features Holland's "Big Red" Lighthouse. And we even have a few pointers on how to avoid too many mosquito bites. So sit back and enjoy our latest Lake Effect Living. And let the lake work its magic on you.